These days email is so important to our businesses and our lives. With just one click though, an important message can seem to be gone forever! Give yourself some peace of mind with Data Recovery Pro – recover deleted emails and lost files. This essential software securely scans for and brings deleted email messages back to life, even from Vista Windows Mail. It can even recover deleted email attachments. Data Recovery Pro is so powerful it can also recover partial files due to bad sectors. 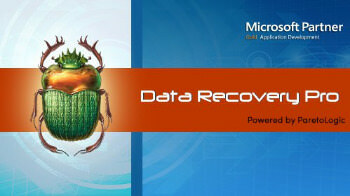 As well as email, Data Recovery Pro can recover a wide variety of file types. It has the ability to retrieve missing files from many peripheral storage devices, including your iPod Shuffle, iPod Nano, and iPod Classic. Data Recovery Pro is so sophisticated it can even recover files from freshly formatted or partitioned drives. A completely updated filter technology allows you to easily search for “lost” text, allowing you to find files by searching for just a key word or phrase. Using ParetoLogic’s easy-to-use interface, Data Recovery Pro guides you through the steps of finding files and recovering them. You can preview most files before recovery or even search for text that might be in a lost file. It allows you to sort the list of what is recoverable to easily find what you are looking for. As with all ParetoLogic software, Data Recovery Pro is backed by the company’s excellent customer care and support program. Our staff is here to help you.